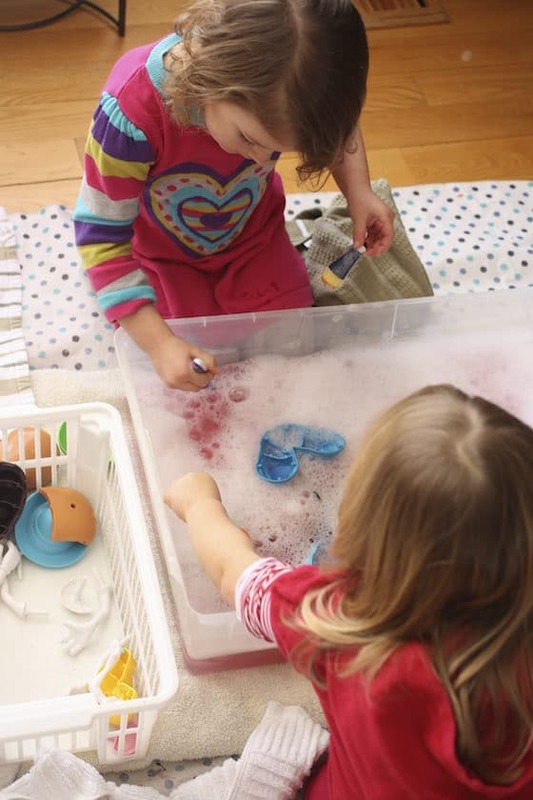 Set up an indoor toy wash as a fun way to combat germs, and to clean your toys during cold and flu season. It’s a great way to clean and sanitize toys in a childcare setting AND a fun way to keep the kids entertained when you’re stuck inside on a snow day or a rainy day. As you can imagine, in a daycare setting, toys can get pretty icky during cold and flu season. Messy sneezes, runny noses, kids coughing constantly… and the kids are all handling the same toys, passing germs from one another. 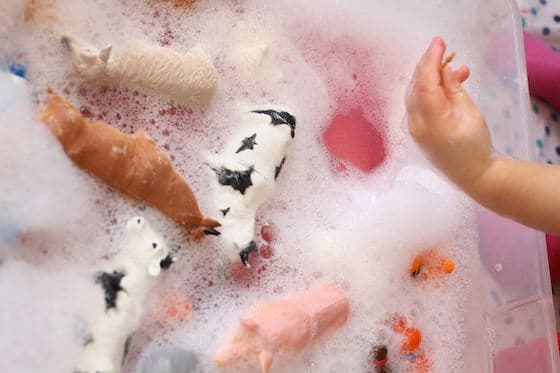 While I do believe that we need to be exposed to a moderate amount of dirt and germs to have healthy, functioning immune systems, when cold and flu season is in full-throttle, extra measures need to be taken to wash the toys to prevent the unnecessary passing of illness and to keep the gross-factor to a minimum. Let’s face it, when a child sneezes and sprays saliva and other unmentionables all over the toys that everyone is gathered around, it’s gross. I do have a strict daycare illness policy and I teach the hooligans, from a very young age, to cough and sneeze into their elbow (often said in panic: “AGHHH!! Into your sleeve, into your sleeve, into your sleeve!”). We wash our hands after every nose-blow, we get lots of fresh air and exercise, and we load up on fresh fruit and vegetables at snack and lunch. Despite all of our efforts, it’s pretty much guaranteed that every child will become sick with a cold at least once in wintertime, and as a result, our toys will be sneezed on, and coughed on, and touched with hands that are germier than one would like to think. How do we keep our toys clean during cold and flu season? 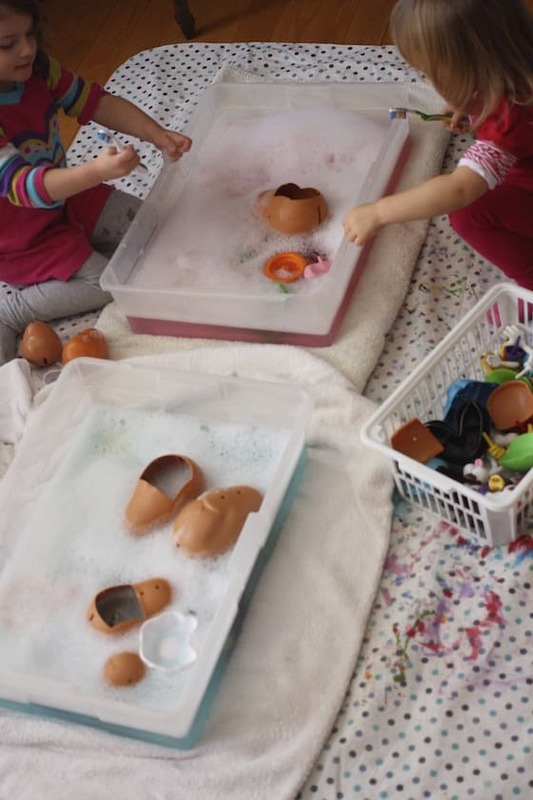 In my daycare, we often set up an activity know as The Toy Wash, and we do it regularly during the winter months. 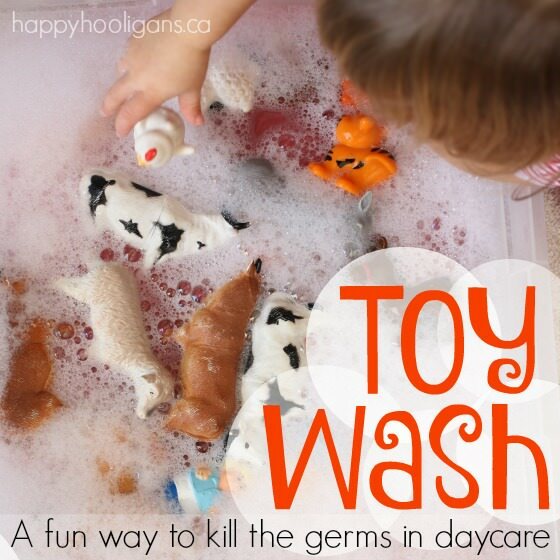 A toy wash is a great way for the kids to have fun while cleaning the toys. 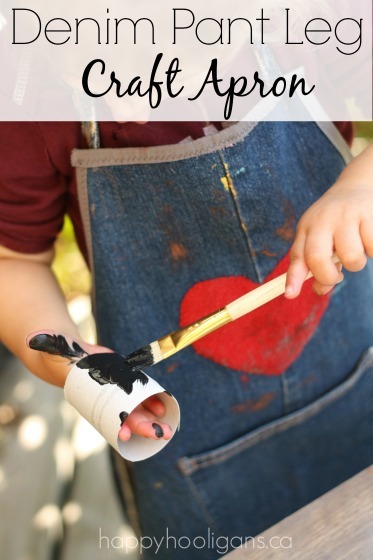 It’s a particularly great activity to do when we’re stuck indoors due to freezing temperatures, when a blizzard prevents us from playing outside, or even on a rainy day. 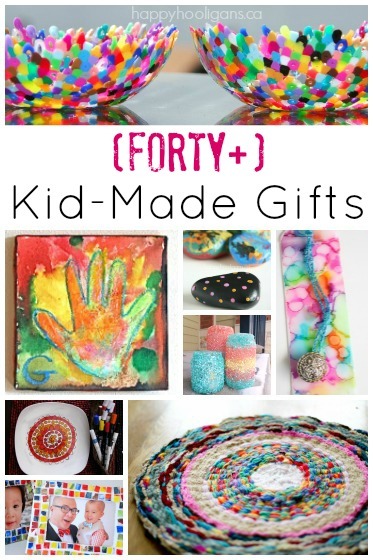 Not only is it a fun water-play activity that keeps the kids entertained for ages, it takes care of cold and flu germs that are lurking on the toys, and leaves them squeaky-clean. The hooligans LOVE a water activity, especially when soapy bubbles are involved. Just check out our baby bath station activity, shaving cream car wash, and muddy car wash activity if want to see them in action. 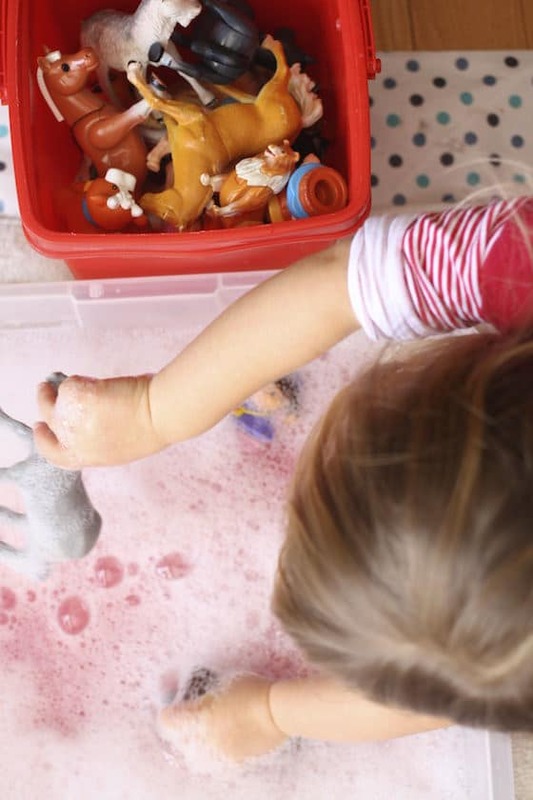 A toy wash activity soothing and relaxing, and there’s plenty of opportunity for imaginative play while the children wash and scrub and dry the toys. It’s a wonderful activity when we’re cooped up indoors. If there’s only one child here, I set them up at the double-sink in the kitchen. I fill one sink with soapy, warm water for washing, and I fill the other sink, with clear warm water for rinsing. First, I spread a plastic tablecloth out to protect the floor from spills cuz you know there are gonna be splashes and spills. Then I place a thick towel down for each basin to sit on. This is a must as the towels will absorb most spills and prevent the table cloth that the children are sitting on from getting soaked. I give each child a couple of tea towels for drying their hands and the toys while they’re playing, and I roll up their sleeves. I fill the basins with warm water, adding a squirt of dish soap and a few drops of food colouring to tint the water. 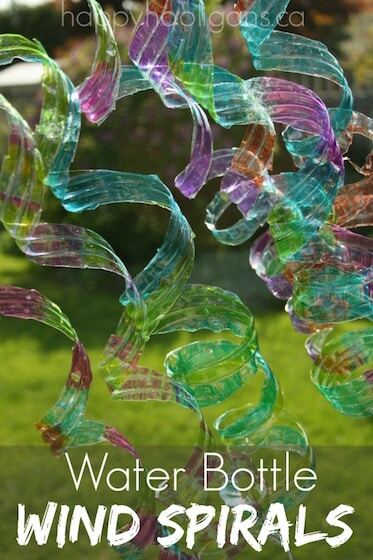 The food colouring is optional but it does make the activity a little more exciting. We swish the soap and food colouring with a whisk to work up some foam, and the toy baskets are placed next to the basins. 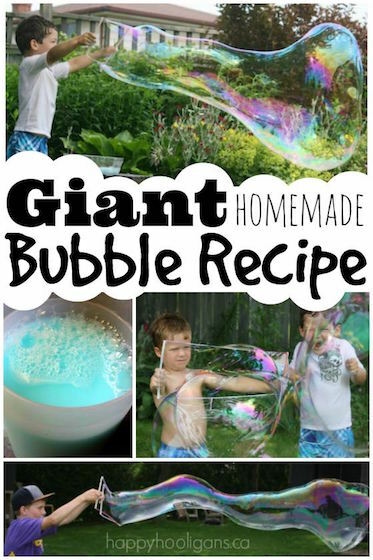 I set a large bowl of clear water on the mat for the children to rinse their toys in to remove the soap bubbles. Let the toy wash begin! Today, we’re washing our Potato Heads and farm animals. On another day we’ll wash our Little People and Polly Pockets. 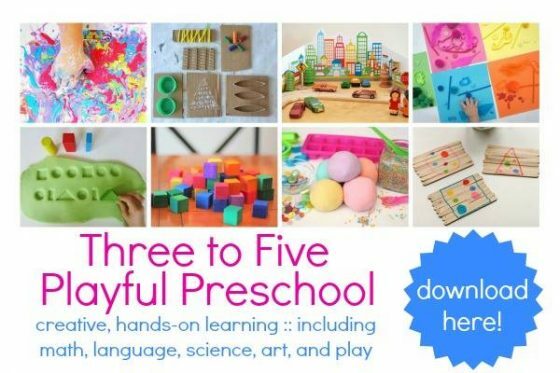 We’ll wash cars and trucks, foam blocks and Duplo, our play-dough tools and plastic play food. Basically, we’ll wash anything that’s waterproof. If it can get wet, in it goes! 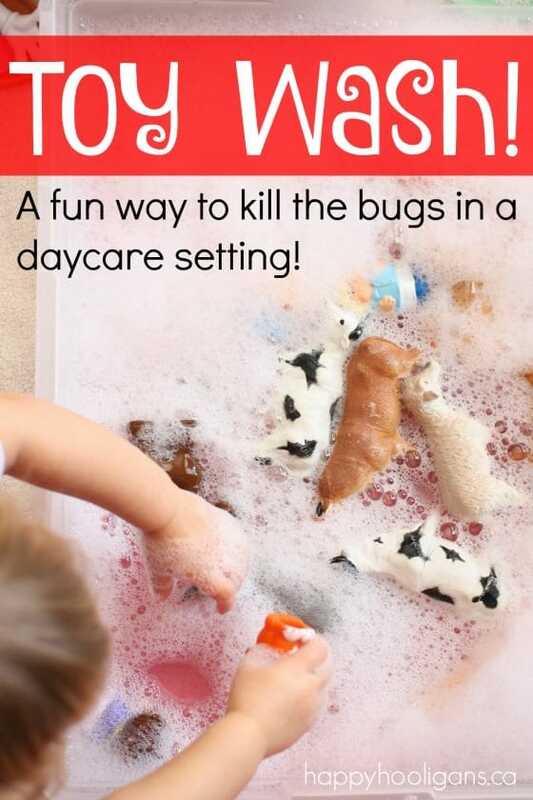 The kids love scrubbing the toys, swishing them in the soapy water and rinsing them clean. And all the while they play out little scenerios with the toys that they’re washing. 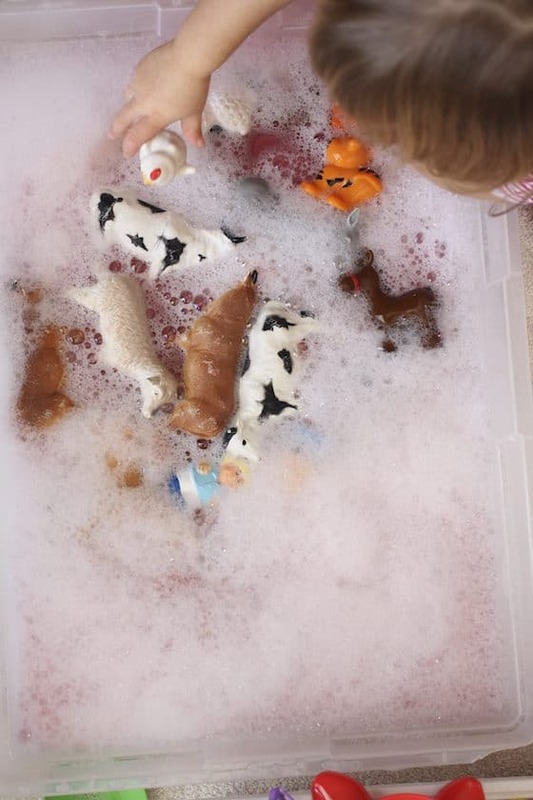 When the toys have been thoroughly cleaned, they’re dipped in the bowl of clear water for rinsing. Then they’re set on a large towel to dry. What a great way to spend the morning, and a fun way to safely clean the kids’ toys in a home daycare. And while we’re on the topic of cleaning, check out these 15 awesome cleaning tips from One Crazy House! 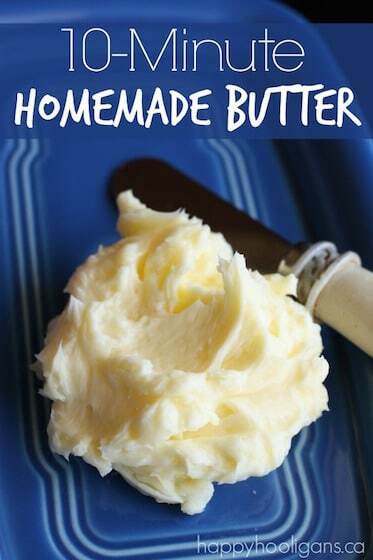 This is so smart! 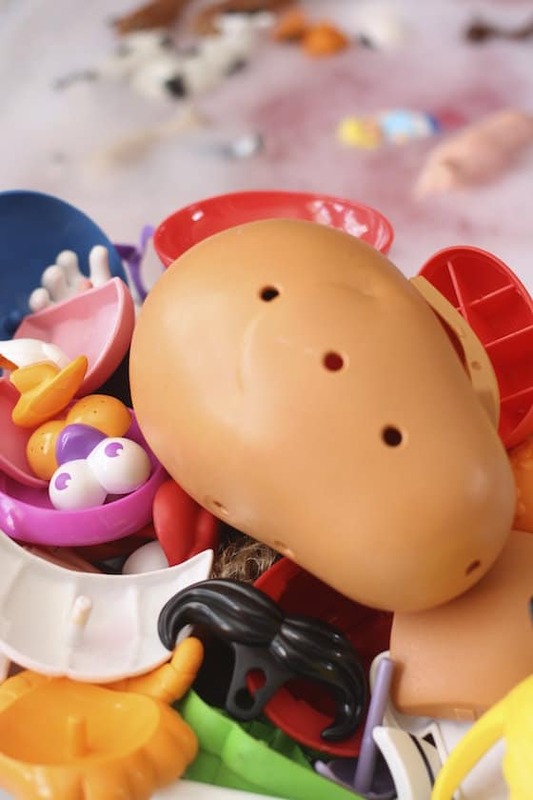 I always dread cleaning my son’s toys because it’s so time and space consuming (we live in a small apartment). 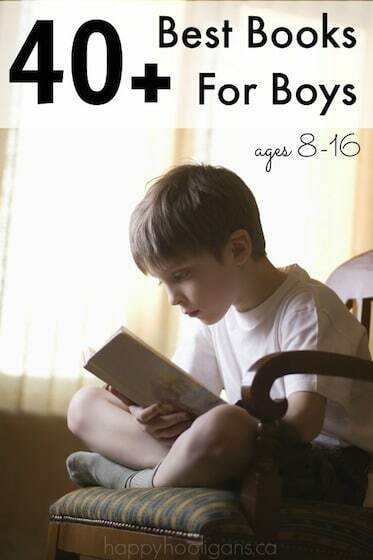 But by getting him to help me give his toys a “bath”, it’ll be less of a chore and more fun playtime! Thanks very much for this great idea, I don’t know why I didn’t think of it sooner lol. Yay! Glad you like the idea, Monica! Happy washing!